Almost every year K takes me on a vacation for my birthday and our anniversary. It’s really a big thing with us. We generally pick somewhere that has a beach. It’s just so relaxing and I love watching K playing in the ocean or the gulf even though it scares me half to death because he wanders out so far. Hey! There’s sharks out there! 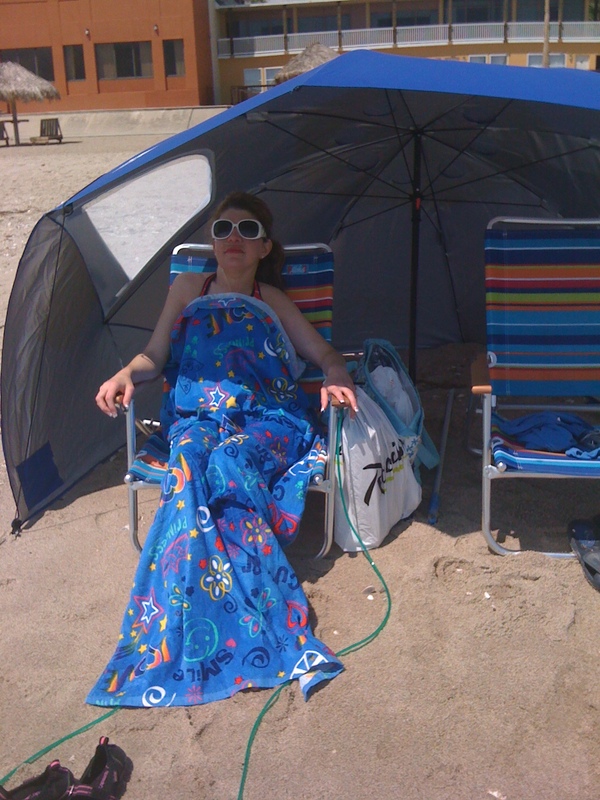 In this picture, K devised a way for me to not get too much sun. I get sun poisoning pretty badly because of my heart medicine. I love sitting under the umbrella watching K play and then when I’m ready, filled with energy, I wade out into the water. I have my portable oxygen tank in a plastic bag, attached to the chair. Sometimes, K will dig a hole in the sand and drop the tank that’s in the bag in the hole. He’s my personal MacGyver! I use my 50ft oxygen tubing so that I can reach from my chair out to the water. All I have to do is watch out for other people on the beach if it’s crowded. Another idea I’ve thought of doing with the tubing but haven’t tried it yet is to cover the tubing with sand. Then people can walk on it. K tries to take me out in the early morning or late evening when the temperature isn’t too hot. I last longer at those times. How to play on the beach with oxygen.